Because the eyes are such a recognizable feature on a person’s face, it cannot be overemphasized the need for natural results when performing eyelid, or blepharoplasty, surgery. When the skin or underlying tissues of the eyelid loosen it leads to a tired or sad appearance. Blepharoplasty, or eyelid surgery, can help you look well-rested by reducing the excess skin or fat from the upper and lower eyelids. In addition to the cosmetic enhancement, it may even improve a patient’s field of vision when there is too much skin in the upper eyelid. For upper eyelids, the incision is made in the natural crease. Excess skin, muscle, and sometimes fat is reduced. The incision is then closed with sutures that will be removed one week after surgery. 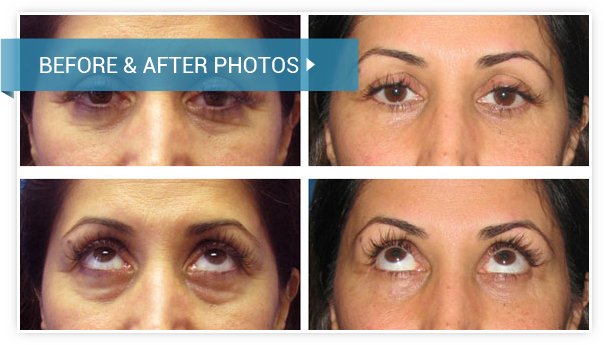 In some patients an upper eyelid surgery, or blepharoplasty, needs to be combined with a browlift, or forehead lift. Dr. Dadvand will be able to guide you toward making the best decision in these cases. There are different options for lower eyelid surgery, or blepharoplasty. If the issue is too much fat bulging, but the skin is not loose, Dr. Dadvand uses a transconjunctival approach. This incision is placed on the inside of the lower eyelid which leaves little to no visible scar. If there is loose skin, Dr. Dadvand uses a subciliary incision just under the lower lashes. The excess fat and skin is addressed. This incision heals well and is virtually undetectable. Dr. Dadvand’s eyelid surgery, or blepharoplasty,is an outpatient procedure performed under IV sedation or general anesthesia and typically takes 1 hour. You may have some swelling or bruising which will subside. There is very little requirement for pain medication as blepharoplasty is not typically a painful procedure. Contact the office of Dr. Babak Dadvand, where his friendly and courteous staff will schedule a consultation for you.